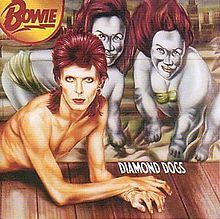 Atomic Sourpuss: A Godawful Small Affair: Seven "Diamond Dogs"
A Godawful Small Affair: Seven "Diamond Dogs"
You join us at a point where Bowie is clearly going extremely bonkers. "Diamond Dogs" is, for the large part, a project thrown together from the splintered remnants of an attempt to make a musical stageshow of George Orwell's "1984" - yes, you read that right, and no, I don't think it's a good idea either, but it's not like anyone was going to tell Bowie that in the Seventies. If he'd announced he was going to kick a hippo to death in Euston Station back then he'd probably have been handed a large record company advance to do so, and to hell with the practicalities. Said ridiculous idea (the musical, not the hippocide) came most of the way to fruition until Orwell's estate stepped in and put a stop to things, and instead we get this: an album that "isn't" about "1984" in any way shape or form, as can clearly be seen by such song titles as "We Are The Dead", "Big Brother" and - whoops! - "1984". You'd think that a damage limitation job like this would probably be garbage, and you'd be wrong, you idiot, it's actually great, not bad like YOU thought. Jesus, why do I hang out with you anyway? You're such a square. Anyway, file this one under "G" for great, and get ready for your writer to throw historical perspective and balance out of the window and turn this entry into a love-in. This is quite simply awesome, awesome stuff. From the apock 'n' roll of the title track we immediately hit a high water mark in the three tracks (I don't care if revisionist history has this as a one-track medley) "Sweet Thing", "Candidate" and "Sweet Thing (Reprise)". If you've not heard this sequence of tracks, I insist you do. No, no, I really must insist. The staggering highs! The sordid lows! The desperate middle! And just to put the cherry on top, as we stumble wounded away from this spectacle, with the world's sleaziest guitar stalking our every move, what do we get next? "Rebel Rebel". To quote Bedford in 1997: that's quality. Actually, scratch that - we end the album with "Chant Of The Ever-Circling Skeletal Family", about which the best I have to say is that it may have made more sense in a musical that was never made largely because it made no sense. Oh well, you can't have everything I suppose, and as the worst I could say is that it's throwaway nonsense, it's certainly not enough to burst this bubble. "Diamond Dogs" - it's a MUST! Join us next time for something completely different, featuring a visiting Beatle. A Godawful Small Affair: Eleven "Heroes"
A Godawful Small Affair: Ten "Low"
A Godawful Small Affair: Eight "Young Americans"